Brooks Koepka is just one shot off the lead at the CJ Cup. Scott Piercy roared into the lead after round two of the PGA Tour's CJ Cup in South Korea, posting a bogey-free 65 to take a one-shot lead over Brooks Koepka. With scoring much easier due to the improved weather conditions, the American was one of five players to post bogey-free rounds, with none of the 78-man field had managing such a feat on day one. Piercy, who finished tied 27th at last week's CIMB Classic in Malaysia, started steadily with four straight pars but then birdied seven of the remaining 14 holes to hit the front on 9-under 135. 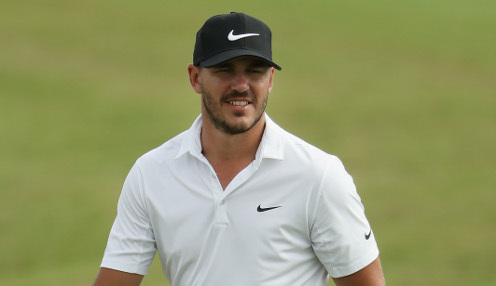 Three-time Major winner Koepka matched his compatriot's 65 to move into solo second while first-round leader Chez Reavie dropped to solo third after a 70. There were also moves from European Ryder Cup stars Ian Poulter and Alex Noren. The duo now share fourth spot on 5-under - four off the lead - after shooting 69 and 65 respectively. Piercy is the one they all have to catch though and he said after his 65: "Yeah, it was a good day. Hit a couple close and then my putter showed up and made some putts of some pretty good length to kind of complement some of the shorter putts that I had. "The wind was down a little bit and from a little bit different direction, so 10 miles an hour wind versus 20's is quite a big difference." Piercy is 4000/1 to win the CJ Cup, with Koepka 1/250, Noren 500/1 and Poulter 4000/1.